Our Industrial Root Grapple are built from 1/2" thick steel plate on the top and bottom. We also incorporate 4" square tubing. The Industrial root grapple recommended machine size is 45 – 65 hp. 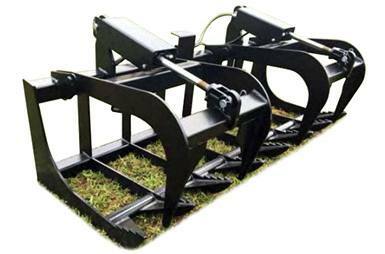 Our industrial root grapples are our top selling root grapple because most people own the 45 – 65 hp skid steer machines. What makes this root grapple different is the thickness of the steel plate which is 1/2" top and bottom compared to our Econimy Root Grapple which is 3/8" top and bottom. Recommended machine sizes: 45 – 65 HP. 1/2” thick steel plate on the top and bottom. 2” bore by 10” stroke cylinders. Hydraulic lines routed inside the tubing to prevent tears. Available Sizes: 63”, 66”, 72”, 78”, 81”. Our skid steer heavy duty root grapple attachments are powder coated and all hoses come with protective sleeves to give the attachment the best protection.